Between January 4th and January 11th 2019, the West Grey Police Service responded to 78 calls for service. On the morning of January 9th 2019, the West Grey Police conducted a traffic stop on a vehicle on Kincardine Street in the former Town of Durham in West Grey after observing the driver not wearing a seat-belt. During the stop police observed the driver attempting to hide several items and was found to have multiple warrants from other police services. The driver was arrested and the subsequent investigation yielded a numerous amounts of drugs, drug paraphernalia, and a conceal weapon on the driver. This included a quantity of hydromorphone, hash oil, syringes, and approximately 1.5 kilograms of cannabis. As a result a 38-year-old Walkerton man was charged with No Seat-belt, Disobey Stop Sign, Cannabis Readily Available in a Vehicle, Possession of a Schedule I Substance, Possession of a Schedule IV Substance with the Purpose of Trafficking, Possession of Cannabis for the Purpose of Selling, Possession of a Weapon for a Dangerous Purpose, and Carrying a Concealed Weapon. The accused was held for a bail hearing and later released by the court on recognizance. 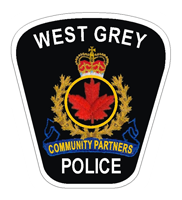 On January 10th 2019, the West Grey Police arrested and charged a 55-year-old West Grey man in connection with a sexual assault investigation. The victim reported multiple incidents which had occurred over a couple year period. The accused was charged with Sexual Interference, Invitation to Sexual Touching, and Sexual Assault on a Person under the Age of 16. On January 6th 2019, arrested a suspect in connection with a lost bank card. The suspect found the bank card and proceeded to use it to make a number of purchases. The suspect’s girlfriend told the victim that her boyfriend had the bank card, the victim then gave this information to police who were able to locate and arrest the suspect. As a result, a 31-year-old man of No Fixed Address was charged with Fraudulent Use of Credit Card. He was released on a Promise to Appear with a court date later next month. The West Grey Police are currently investigating a break and enter that occurred sometime between December 30th 2018 and January 5th 2019. Unknown suspect(s) entered a seasonal property on Concession 12 in the former Township of Glenelg in West Grey and took approximately 30 items with a combined value of $1000. This investigation is on-going and anyone with information is being asked to call the West Grey Police Service at 519-371-6911 or contact Crime Stoppers at 1-800-222-8477 should you wish to remain anonymous.